Gearhart, Oregon is a small town with a rich settler history. In 1848, the Missourian Phillip Gearhart bought most of the land that makes up modern-day Gearhart, as well as a portion of Seaside, a nearby community where Louis and Clark ended their famous 4,000-mile cross-country expedition. Learn more here! Gearhart, Oregon is a small town with a rich settler history. In 1848, the Missourian Phillip Gearhart bought most of the land that makes up modern-day Gearhart, as well as a portion of Seaside, a nearby community where Louis and Clark ended their famous 4,000-mile cross-country expedition. Visitors to Gearhart beach houses and the surrounding area are enchanted by the landscape. Even Clark himself, when hiking what is now Tillamook Head National Recreation Trail, believed this region to be one of the most beautiful places he had ever seen. If you hike this trail, you will be following in historic footsteps. 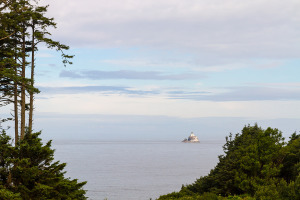 From the trail, you'll be able to enjoy such sights as lush forests, the Tillamook Rock Lighthouse (locally considered to be haunted), and even gray whales. Another favorite scenic spot is the Ridge Path, once the thoroughfare for the Phillip Gearhart land claim, which is now a hiking loop that runs through low dune meadows. Some Gearhart beach houses are located along this path, as is the local golf course. The path will lead you to the Necanicum Estuary, which is home to a variety of native bird species and unique plant life throughout all seasons of the year. Gearhart city itself is also quite lovely. Wide streets are great for riding bicycles, the beach is pristine, and there are public tennis courts. The town is dotted with shops selling everything from art to antiques to home and garden decor. Several restaurants and cafes cater to hungry citizens. And you'll want to join in the walking culture here-everybody walks through this charming town center instead of driving from their Gearhart beach houses, so there is very little street traffic. Even in summer, when the tourist population boosts the size of the town significantly, it retains its small-town feel, and the visitors are eager to embrace the relaxed summer beach atmosphere. Gearhart Golf Links, the oldest golf course west of the Mississippi, is close to Gearhart beach houses. The course was recently renovated to enhance the golf experience, including removing trees to broaden sight lines to spectacular scenery, as well as improving the performance and feel of the greens. This course sports 18 holes of links-style golf that are open to the public 365 days a year.